I acknowledge I don’t have the necessary know-how to launch a successful start-up yet, it would be ignorant to think that I do. That is why, from the beginning, I knew I had to learn a lot in order to make this project work. So in my head, I thought of three big categories that are crucial for the success of this project – Game Development, Start-up launching/management, and Marketing. 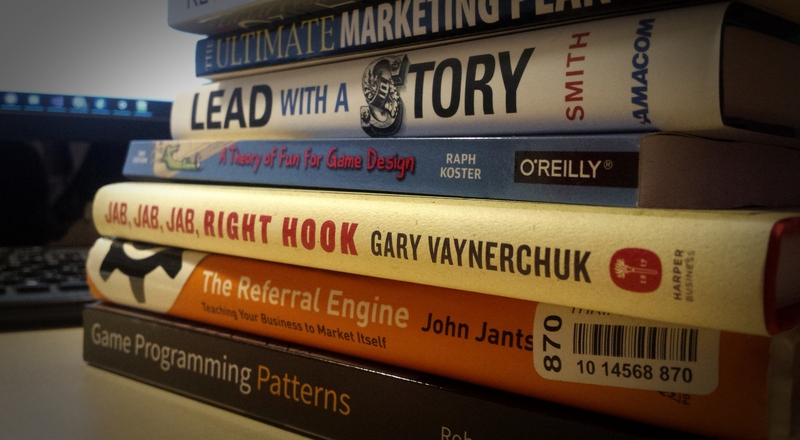 It didn’t take me long to decide that I should get most of the knowledge from reading multiple books. I find reading books to be the fastest way to learn and later remember the new info, compared to school and video tutorials. Unfortunately for me, I am like a turtle at reading, compared to most people I know. I might be starting the sixth sentence while the other person already wants to turn to the next page. It could possibly be because I never really cared for reading until I graduated high school. Until then, I was always told what books to read, all those compulsory literature classics, I didn’t find as compelling as my teachers did. Online summaries often did the trick for me at the books’ tests. When I went to the university we had almost no mandatory reading, so I picked up a few books I found, that interested me personally. That was when I found out about the easily acquirable knowledge hidden in books. So recently I did a little research for the three mentioned categories and put together the longest possible list I thought I could probably manage to read in 6 months manage – 15 books. I will have to read through all of them in those 6 months, as I’ve set the objective to launch my studio in May 2018. Probably way too many books, but I will do my best to work through them all. 11. The Ultimate Marketing Plan: Target Your Audience! Get Out Your Message! Build Your Brand! This was my complete list at the moment in no particular order, just split into three categories. It could possibly change if I find books, that could benefit me more than the ones mentioned. Currently, I’ve started with the book Game Programming Patterns. I found it logical to have some programming architectural wisdom when I start developing the game, so I’ll have less code to refactor later. I am planning to write at least one blog post about each book explaining if any entrepreneur or indie game developer should care to pick that book up. I will give my input to the things I found useful and the things I didn’t, so even if you don’t read the book, maybe you will pick something up from reading my blog.